In an incredible display of training and tenderness, a pit bull demonstrates just how darling the relationship between dog and baby can be. 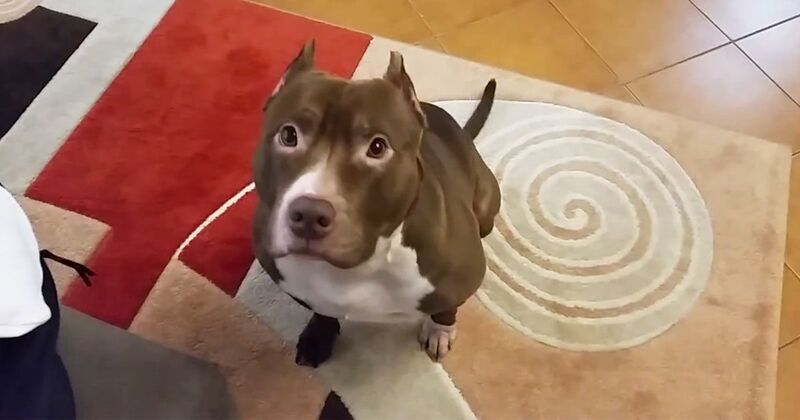 His name is Diesel and when his owner calls him over and tells him to find Ridley the baby, he knows exactly what to do. Watch the sweet video below to see just how lovingly Diesel attends to the baby, putting his wet nose against Ridley's face. "Bravo, Diesel!" his owner proudly praises. It's clear from the video that Dad has excellent verbal control over Diesel, and has put in the time to teach Diesel how to behave around the baby. As excited as Diesel is to do a task and get praised, he is calm and controlled when approaching the sleeping Ridley. Given the positive, supervised interactions that began between Ridley and Diesel since Ridley's infancy, it's no wonder that the two continue to be close as Ridley grew into toddlerhood. While introducing a new infant to a home with a large dog can be very intimidating, there are many steps that responsible doggy parents and parents-to-be can take to ensure everyone's safety. The ASPCA recommends starting training early -- months before the baby is due. While it might seem to make sense to keep the dog and the baby apart, controlled, supervised, positive interactions where everyone is present together is an important step in building good relationships. What do you think of Diesel?